Many anglers turn their attention to preparations this time of year. Maybe you’re preparing for a warm water trip, maybe you’re preparing for the spring fly fishing season, maybe you’re preparing for summer risers. If you’re like us here in Windham, ME, it’s likely there’s snow on the ground and ice on your favorite river. 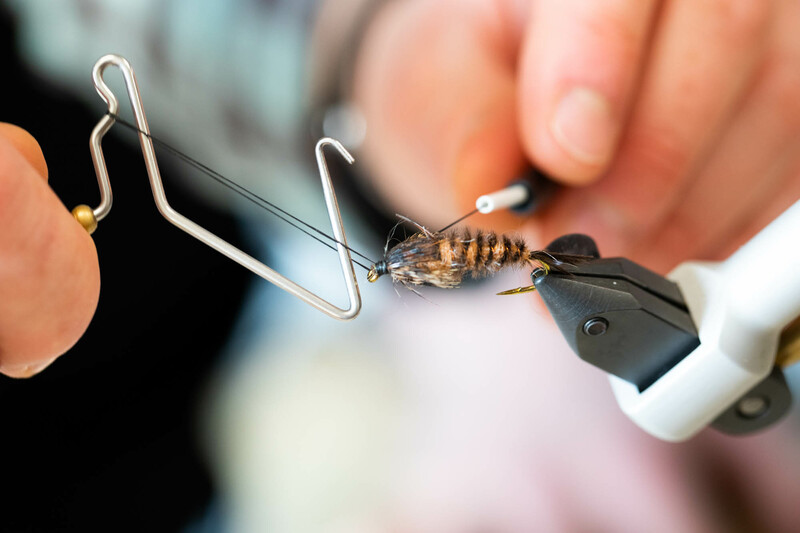 Tying flies is one way to prepare for the upcoming fly fishing season and to pass the time as winter weather freezes fish diets. But where should you start? How do you wade through the thousands of available fly tying devices/tools/materials to find the basic necessities? How do you learn to tie flies? Fly tying for beginners can be overwhelming. We’re here to help. Here’s a list of the most relevant tools of the trade for first-time tyers and some pertinent learn-to-tie info. Here’s a rudimentary list of tools required for beginner fly tyers, the basic necessities. Most of these tools come in a variety of shapes and sizes. For beginners, start simple: simple materials, simple fly patterns, simple tools. 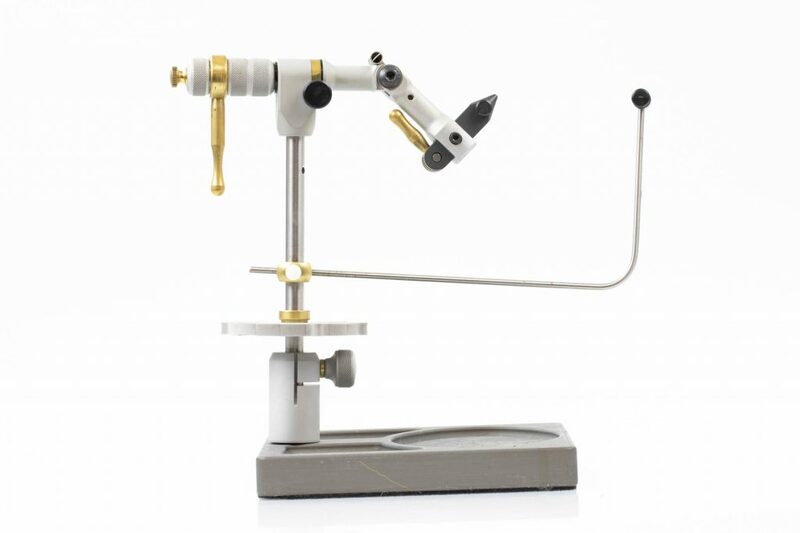 A fly tying vise is perhaps the most important piece of equipment for anyone hoping to tie his/her first fly. A vise’s primary function is to hold your hook in place while you’re tying. Any vice that holds a hook steadily in place will serve your basic vice needs. Naturally, as such an important piece of equipment, there are tons of vise options. A rotary vise, like the Peak Rotary Vise, allows the tier to rotate the hook 360 degrees to tie at all angles, as well as making attaching yarns and chenilles a breeze. Rotary vises tend to be pricier than traditional vises. A traditional vise, like the base model Hareline Super AA Fly Tying Vise, is significantly less expensive and keeps the hook in place at a 45-degree angle. Vises differ in lever types, base attachments, styles and a variety of other specifications. 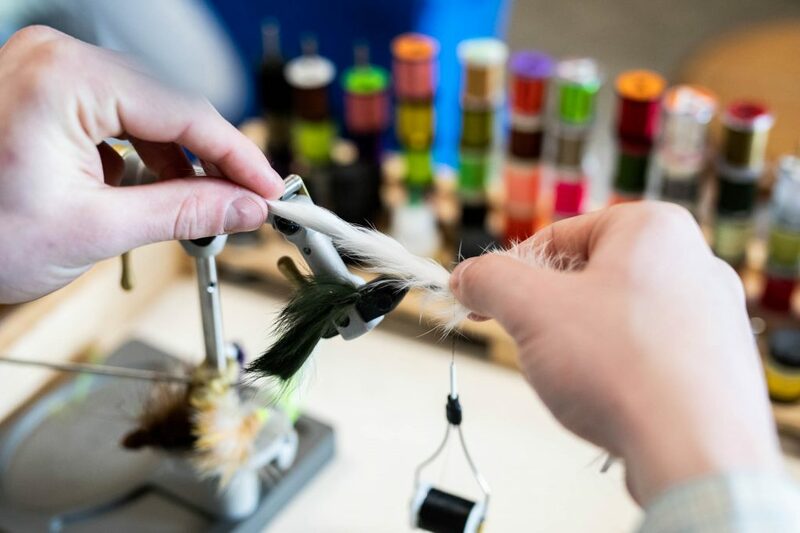 For beginner tyers, vise choice often depends on which flies you plan on tying. A bobbin supports your thread and allows you to wrap flies efficiently. Most bobbins include a thread spool holder and an elongated eye to efficiently aim and control thread wrapping. Bobbins come in a variety of makes and models. A baseline model like an Economy Standard Bobbin utilizes a minimalist design and basic materials. Opposingly, higher-priced bobbins, like the Smhaen pictured above, include a tension wheel to accommodate any thread size, a weather-proof anodized finish to tie in saltwater conditions, and a fray-resistant ceramic tube. If you plan on tying with multiple thread colors/sizes, a bobbin that allows quick thread changes like the Smhaen is important. Thread is importantly used to hold fly tying materials to a hook. 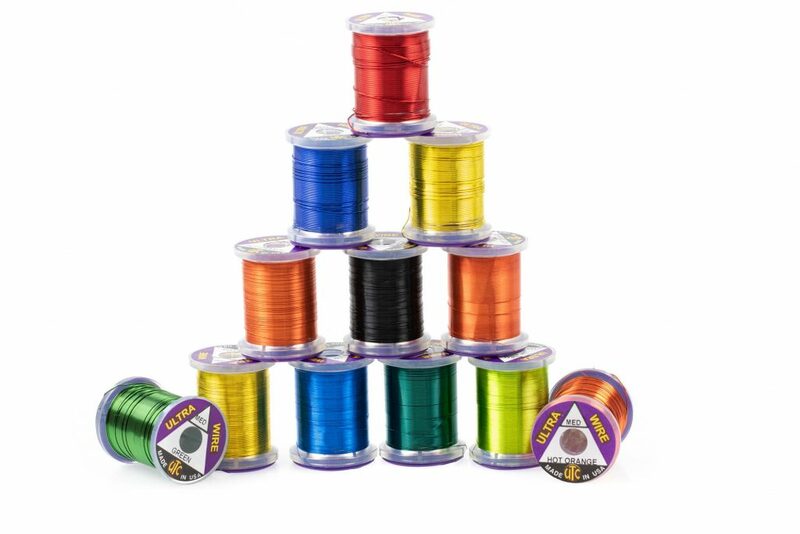 Fly tying thread comes in a variety of colors, sizes, and styles. Generally, thread color and style are chosen to match the color of the fly. If you’re tying a big streamer, a larger, stronger thread like UNI Big Fly Thread will help the fly stand up to toothy targets. If you’re tying a tiny midge, a small thread like Veevus Flat Unwaxed Thread will compliment the profile of the fly and make tying easier. Scissors are a versatile tool at the fly tying bench. Most obviously, tying scissors are used to snip thread after starting/finishing a fly. 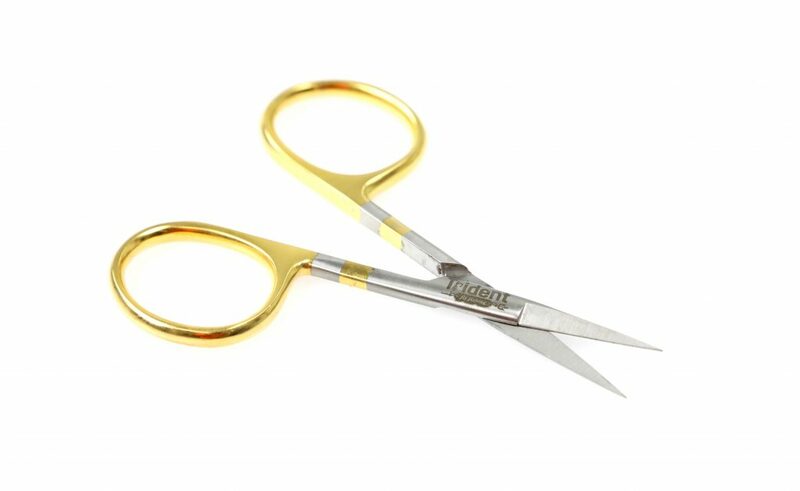 Scissors can also be used to trim excess hair/fur/feathers or to shape a number of materials. Small scissors with a fine point work best when nipping and pruning small flies. A hook acts as the base of the fly. Obviously, every fly has a hook. Hook choice depends on fly choice. If you’re tying a streamer, a long shank hook or streamer specific hook like the Ahrex TP610 Trout Predator Streamer Hook is generally the best option. If you’re tying a small nymph or a midge, a smaller (perhaps barbless) hook like the Gamakatsu C12BM Large Eye Barbless Midge Hook is the best tool for the job. 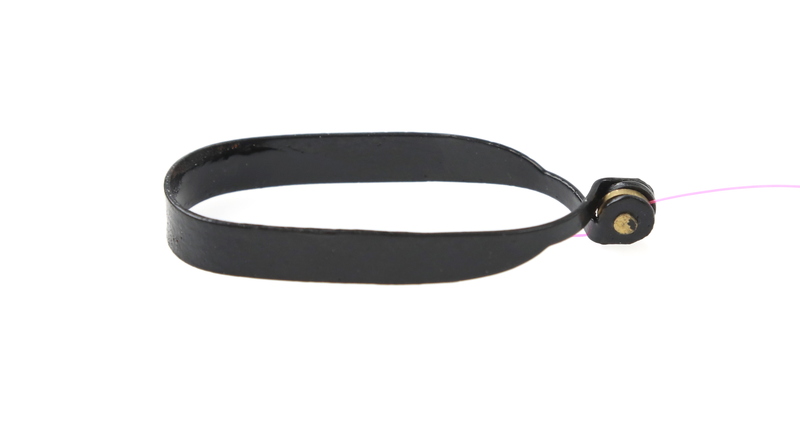 A stout hook in a larger size will serve you well when tying saltwater streamers. A good option is the Gamakatsu Sl11-3H 3X Strong Saltwater Hook in a size 2/0 for example. 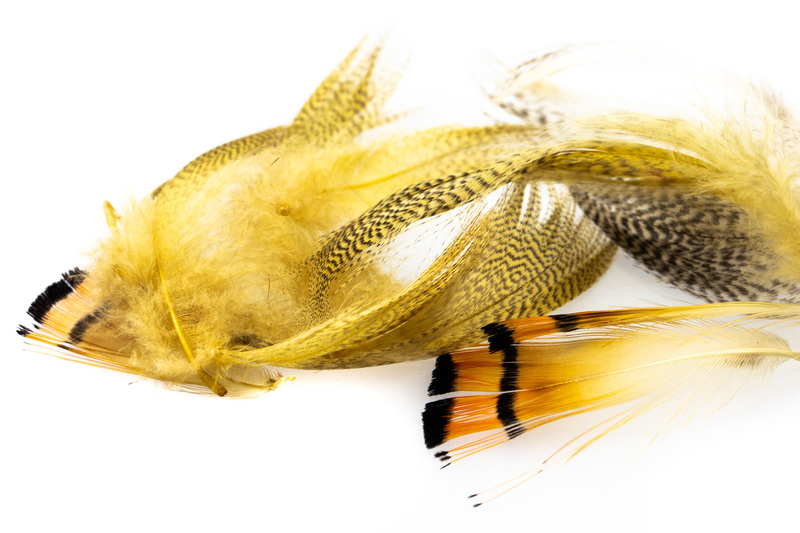 A huge variety of fly tying materials exist from feathers & hackle to synthetics to dubbing and everything in between. Again, your choice of materials depends on which fly you’re tying. 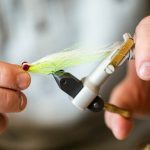 It may be helpful to look up ingredients used to tie the desired fly until you’re familiar with all these materials and how they act both in tying and in the water. Tutorial videos on YouTube where tyers list the materials they use are helpful. 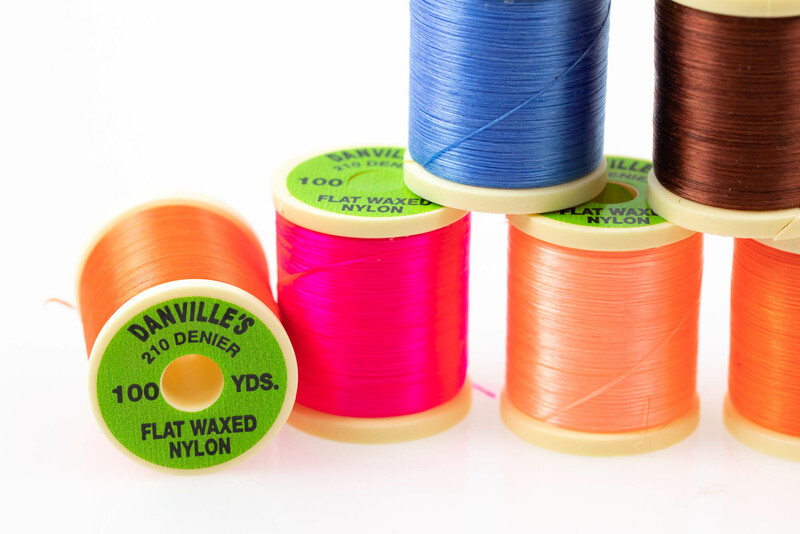 Here are some tool/material recommendations we’ve found helpful in our time tying flies. 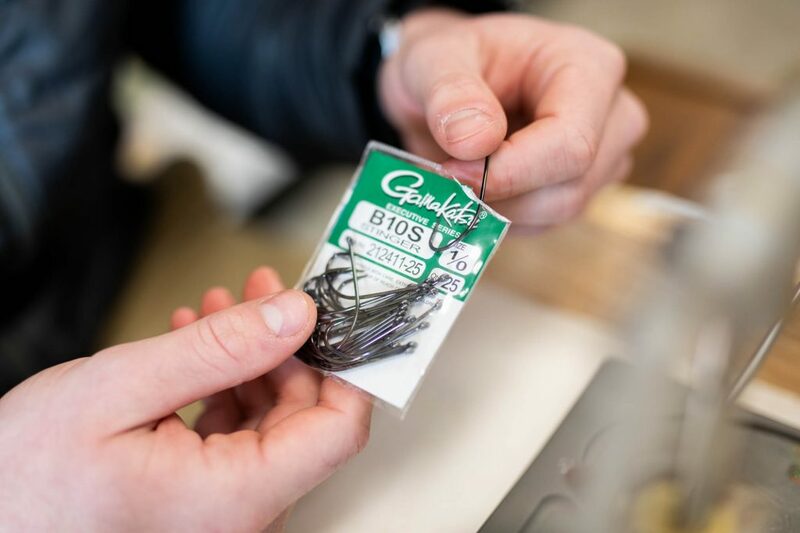 This list includes materials that aren’t necessarily crucial for novice tyers but are worth considering if you plan on tying flies regularly. Beads, coneheads, and eyes add worthwhile dimension to any fly. 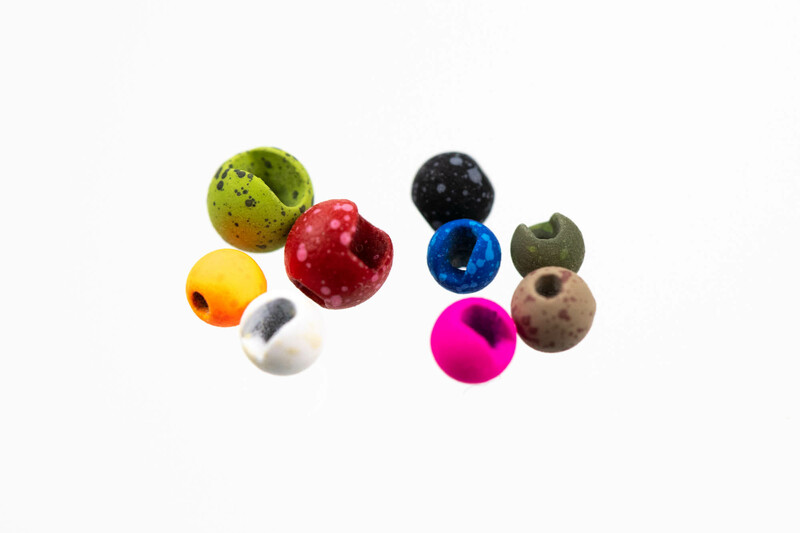 Many tyers use tungsten beads, like the Mottled Tactical Slotted Tungsten Beads pictured above, to help small nymphs quickly sink to the river bottom when tying flies for trout. Coneheads or eyes, like the Hareline Brass Cone Heads, can also add important weight to streamer patterns. Beyond weight, however, coneheads provide a natural front profile to subsurface flies and bright colors are often utilized to attract fish. 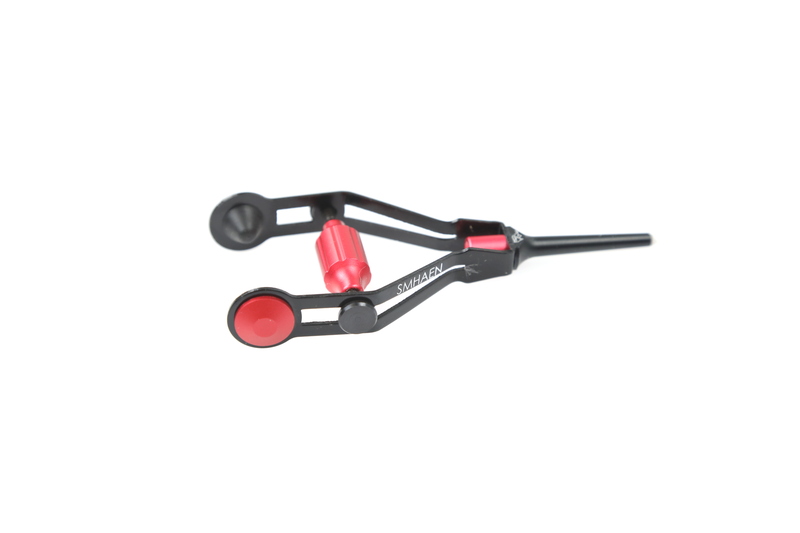 A whip finishing tool makes finishing any fly easy and efficient. Struggling with knots to hold materials in place? A whip finisher, when used correctly, assures that thread and materials are secured in place so your fly doesn’t unravel on the water. Whip finishers with a wide opening like the Griffin Long Reach Whip Finisher make finishing big flies seamless. If you’re planning on routinely tying, a whip finisher is an important tool to consider. Similar to a conehead or eyes, wire adds weight to nymphs and streamers. Wire can be wrapped before materials are added or after you tie in feathers or fur. A spectrum of colors and sizes will fit any fly and give that nymph a little extra shine in the water. UTC makes Ultra Wire (pictured above) and Brassie Wire in a variety of colors. If you prefer heavier, stiffer streamer wire, Hareline's Round Lead Free Wire is also a great option, especially in fisheries that don't allow lead. Excess hair, feathers, and thread pile up at the vice, especially if you’re tying a lot of flies. A wastebasket is a useful tool to keep your tying area clean and free from clutter. A wastebasket is also a great tool for recycling and reusing old materials. Don’t throw away your scraps, keep them for the next time you need a bit of elk hair or some leftover flash. Hackle pliers are used to securely grab the end of a lengthy material before wrapping it into your fly. Grab and wrap easily instead of wrapping that yarn by hand. Similar to the function of a bobbin, hackle pliers allow the wrapping of hackle and other materials in a focused and efficient manner. Most hackle pliers are similar in design, although Stonfo makes a Long Spring Rotary Hackle Plier that allows a tyer to tighten and maneuver hackle on larger flies. Rotary pliers continuously rotate to minimize twisting and warping of hackle during wrapping. A hair stacker helps organize and bundle materials. Especially when tying dry flies, it’s important that hair is equal and even throughout the fly. A hair stacker allows the tyer to quickly assemble a series of materials in an even and balanced way before tying them into the fly. A stacker is a huge time saver at the vise. 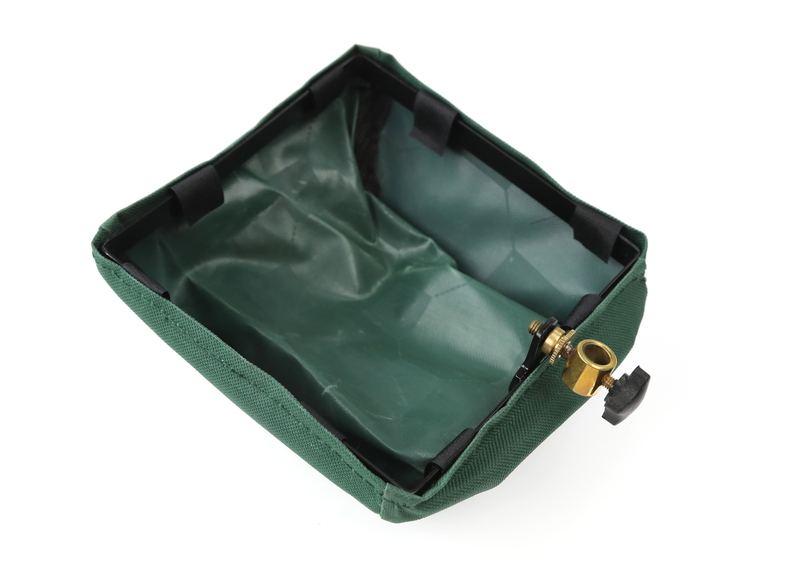 Fly tying kits are also a worthwhile consideration. Tool kits provide anglers with fundamental tying tools necessary to craft your favorite bug. If you already have a vice, I’d highly recommend the Dr. Slick Fly Tyer Gift Set. This set includes scissors, a whip finisher, hair stacker, bobbin, bobbin threader, hackle pliers, and a bodkin/half-hitch tool. Buy whatever materials you need and you’ll be off to the tying races. Check out our YouTube Channel for step by step instructional fly tying videos. Videos include popular patterns like the Gray Ghost Streamer and the Clouser Minnow. We’re always working on more fly tying content, so check back often for more patterns. Feeling Social? Use #tridenttying on Instagram to share your fly tying photos with us. Who knows, we may even feature your photo on our page. Need advice or fly tying recommendations? Call Trident at (888) 413-5211 or email us at support@tridentflyfishing.com to talk to an expert.